Deepika Kurup: My name is Deepika Kurup, I’m 17 years old and I am a freshman at Harvard College. I grew up in Nashua, New Hampshire and graduated from Nashua High School South. Deepika Kurup: I’ve always been curious about the world around me. When I was younger, I’d constantly ask my parents questions about how the world works, and their explanations were often rooted in scientific concepts. As I grew, I began to notice that science is truly everywhere. After hearing about scientific discoveries on the news and reading stories of famous scientists in the past, I realized that science has the power to lead us to revolutionary new discoveries that can change the world. This passion for science, combined with my interest in solving global challenges, is what sparked my interest in research. ThinkSTEAM: Can you briefly describe your research in water purification? Deepika Kurup: I developed a safe, sustainable, cost-effective, and eco friendly solution to the global water crisis. Basically I synthesized a novel photocatalytic composite that combines filtration with photocatalysis to remove bacteria and organics from water. ThinkSTEAM: What inspired your research in photo catalysis? Deepika Kurup: Every summer my family and I travel across the world to visit India. In America, I always had the privilege of having unlimited access to potable water; however, in India I saw children drink water that I felt was too dirty to touch. I wanted to find out why these people lacked access to safe water, a substance that’s essential for life. I learned that we’re facing a global water crisis. According to the World Health Organization, one-ninth of the global population lacks access to clean water. This unacceptable social injustice compelled me to find a solution to the world’s clean water problem. Deepika Kurup: There were several technical challenges I had to overcome. My experiments did not always go as planned, and I had to look for alternative solutions. For example, initially I struggled to find a proper binding agent for my photocatalytic composite. I tried several eco-friendly epoxies and adhesive sprays, but they were either not robust when in contact with water, or were not suitable for human consumption. Although it was frustrating when my early methods did not work, I was determined not to get discouraged and persevered until I discovered the appropriate binding agent: cement. Conducting research throughout the school year also proved to be difficult, as I had to learn how to balance my time in the lab with the time it took to perform well in advanced classes and participate in extracurricular activities. I often had to miss school in order to travel to various science fairs, speak at schools, and present at invited events across the nation. I had to work late hours to make up for missed homework, labs, and tests. Overall, I was able to manage my time by prioritizing my tasks and working efficiently. ThinkSTEAM: What was it like to win the Discovery Education 3M Young Scientist Award in 2012? Deepika Kurup: The DE3MYSC was the first national science competition I entered in. It was very rewarding to see that the judges felt like my research had the potential to make a difference in the world. Of course, the best part about the competition itself was meeting the other finalists, not winning. ThinkSTEAM: How did it feel to win the U.S. Stockholm Junior Water Prize in 2014? Deepika Kurup: The year I won the US SJWP was the second year I participated in the competition, and I was really honored that I was able to represent the United States at the international competition in Sweden. ThinkSTEAM: What was your reaction to being named as one of Forbes’ 2015 30 under 30 in energy? 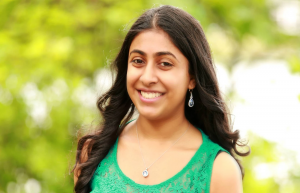 Deepika Kurup: I was very surprised that I was selected as one of Forbes: 30 Under 30. I was notified that I had been nominated, but did not really think much of it because I was sure I would never be selected. Then a few months later as I was scrolling through my Facebook newsfeed, I saw an article about Forbes releasing the 30 Under 30 list, and was shocked to see my name! ThinkSTEAM: What do you envision doing in the future? Deepika Kurup: In the future I hope to continue to pursue my interest in scientific research and explore different fields of science. Deepika Kurup: I would strongly encourage other young women scientists to continue to pursue their passions in science, technology, engineering and math. While scientific advancements are being made every day, our world still faces several grand challenges. We need young scientists to solve these grand challenges, as science has the power to help people find solutions to problems we never thought could be solved.